Articulation marks refer to the way a note is played, the "touch". In my 35+ years of teaching, I have never met a child who understands what "stressed" or "detached" or "well marked" means (as it pertains to music anyways! LOL). If you struggle with understanding (or teaching) those articulation marks and terms, you are not alone! In order to understand and teach articulation effectively, it is often fun to think outside of the box! Are you ready to have some fun (and to learn why I keep a cup of Lego in my studio)? Portato is not included in this Syllabus, however I like to include it when teaching Articulation since I refer to it often (especially when teaching in Baroque Style). So - how do we teach these Articulations marks when students have no clue what the descriptive words or definitions mean? Students have different and varied learning styles. I am blessed with an abundance of students with varied learning styles - Visual, Auditory, Kinesthetic and Special Needs. An effective way to explain different articulations to a Visual Learner is to use your Ultimate Music Theory Whiteboard and visually map out the length of sound given to each note. If a regular Quarter Note note is one complete "block of sound", then we could describe the different articulations in terms of how much of that "block of sound" each receives! Accent - the full block of sound, but played much louder! Using our metronome set at a very slow speed, we then played these notes on the piano to hear the lengths. Jaydon was able to See, Hear and Feel the different Articulations. Prutha (on the left) is primarily a Visual Learner while her sister Kenny (on the right) is primarily a Kinesthetic Learner. They share a 2 hour Piano/Theory lesson. While working with Prutha on the different articulations in her Level 4 Baroque piece, she was struggling with the concept of the Baroque Portato Touch. Since Kenny was working on her Prep 1 Rudiments Lesson on Articulation (Page 102), out came the Lego! Kenny took the Lego blocks and added them together to show the length of sound that each articulation sign would create over a quarter note "Lego block". 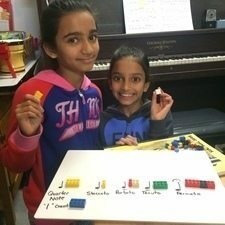 The accent isn't shown on her chart - but Kenny decided that she could "yell" the 1 count quarter note Lego Block at her sister to explain an accent! We then played these on the piano. Both girls were able to See, Hear and Feel the different Articulation marks (and we had a blast!). Bonus - when Prutha returned to playing her Baroque piece, she played with a perfect Baroque Portato touch! If you noticed, each of the above activities ended up with us playing at the piano. It is important to make this auditory connection with what the student is seeing and feeling on the Whiteboard. 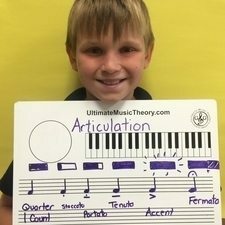 For an Auditory learner, use either Whiteboard Game to create the Visual and Kinesthetic connection - and then add an Auditory Listening Game on the piano! Set the metronome to a slow, steady quarter note beat and then play several notes in the same articulation. Ask your student to identify the articulation played. Then, SWITCH! 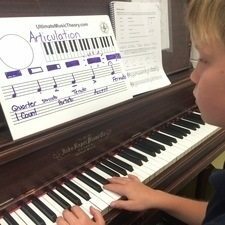 The student plays the articulations on the piano and the teacher must identify them! By having the student be the "teacher", you are ensuring that the student truly does See, Hear and Feel the different Articulations (and they will LOVE trying to trick you!). Students may start with Prep 1 and Prep 2 Rudiments, followed by the Basic Rudiments Workbook. For students who have not started with the UMT Prep Series (Prep 1 Rudiments and Prep 2 Rudiments), but have gone straight into Basic Rudiments, Articulation is taught early in the Ultimate Music Theory Basic Workbook on Page 34. One of the many things that I love about how the Ultimate Music Theory Series presents concepts is that students don't just "learn" the concept to understand it, they learn how to write and use them properly too! 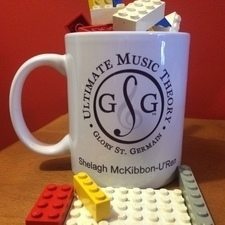 The Ultimate Music Theory Student Packs will give your students the tools to learn! 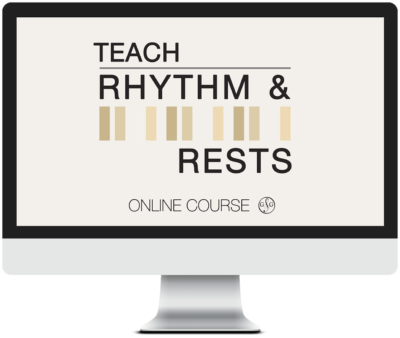 Teach Rhythm & Rests Online Course is a Teacher Training with 8 Video Sessions plus downloadable worksheets on Simple, Compound & Hybrid Time on Teaching Rests. To help you even more we've created FREE RESOURCES for you to use as learning tools and building blocks in your musical adventure.